Freelance journalist Lindsay Gordon is strapped for cash. Why else would she agree to cover a fund-raising gala at a girls' public school? But when the star attraction is found garrotted with her own cello string minutes before she is due on stage, Lindsay finds herself investigating a vicious murder. Who would have wanted Lorna Smith-Cooper dead? Who had the key to the locked room in which her body was found? And who could have slipped out of the hall at just the right time to commit this calculated and cold-blooded crime? Last year at the Bloody Scotland crime writing festival, Val McDermid and Ian Rankin led a torchlit parade from Stirling Castle (where the festival was officially opened) down through the historic town centre. Fittingly, the King and Queen of 'Tartan Noir' (and legends far beyond those borders) were each celebrating 30 years of their crime writing careers. While McDermid is well-known for delving deep into the darkness in her hugely popular series starring detective Carol Jordan and profiler Tony Hill (books and characters which were adapted into the television series Wire in the Blood), and her fascinating bestsellers starring cold case detective Karen Pirie, thirty years ago it all began with two journalists: Val, and Lindsay Gordon. What may surprise some crime-lovers who've become McDermid fans in the last twenty years, is that her very first book was more of a classic Christie-style murder mystery, in a way. Not cosy, but definitely veering much more towards that end of the crime-mystery spectrum than her later books. Of course, McDermid still brought something fresh to her debut story - especially for the late 1980s - Lindsay Gordon was a protagonist who was working class, politically inclined, and and out lesbian. Quite different from the often intellectual, rather sexless sleuths of the classic mystery form. Gordon is sent from Glasgow to Derbyshire to cover a fundraiser at a hoity-toity girls school (in the UK it's called a public school, but elsewhere we'd call these 'private schools' - high schools largely for children of the well-off, somewhat removed from the everyday national education system). The environment immediately irks Gordon, a 1980s lefty battling Thatcherite times and struggling financially. Gordon self-identifies as a "cynical socialist feminist lesbian", so McDermid doesn't leave the reader in any doubt. 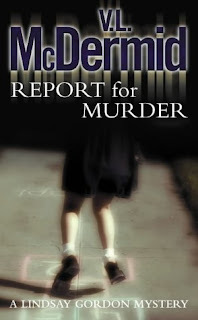 And that's one of the things that distinguishes REPORT FOR MURDER from McDermid's later work - she lays quite a lot out for the reader, with more exposition and set-up. It's a good read, that flows well and has plenty of interest for readers. I thoroughly enjoyed 'going back to the beginning' to see McDermid in more of her raw early form. While the storytelling isn't as tight or gritty as her later work, there's still a lot to enjoy in REPORT FOR MURDER. McDermid brings the country public school setting to vivid life; its physical environment and the characters who inhabit it. There's some interesting character interplay, including a hot-cold budding relationship for Lindsay Gordon. It's hard to know looking back from where we are now, but I imagine it was quite groundbreaking at the time: a lesbian relationship portrayed quite matter-of-factly as if it was just any old romance, rather than highlighting it as something unusual or 'edgy'. All in all, REPORT FOR MURDER delivers a more Christie or Sayers-type mystery than later fans of McDermid may have expected, a murder mystery in a somewhat closed environment, with an amateur sleuth interviewing the suspects and witnesses in order to try and unmask the killer.